What are the goals of DC Optimization: How to define success for a DC optimization campaign. How much do we care about DC health: Methods for quantifying the impacts of DC issues on yearly revenues. The time value of energy: How do we evaluate the long-term impact of DC issues. Defining Actionability : How do we define which issues to address and which to ignore? Data Enabled Maintenance: Using Condition-based and predictive models for DC optimization. In a collaboration with Powerhub, this white paper dives into how the solar asset management landscape is evolving, and what successful players are doing to ensure optimum operations of their plants and ROI of their portfolios, featuring case studies on some key industry players like Longroad, Baywa r.e. and Soltage. 2018 witnessed unprecedented records for the economics of solar+storage, demonstrating a variety of value streams and thus making the tale of this marriage all the more compelling. The plummeting costs of batteries, particularly lithium-ion, paired with changes in net metering policies, have forged opportunities for cost-effective use of solar+storage. According to Wood Mackenzie Power & Renewables, in 2019, the US energy storage market is poised to take over South Korea’s, gaining 21% of the total global energy storage deployment, which are estimated to reach 7.9 GWh. 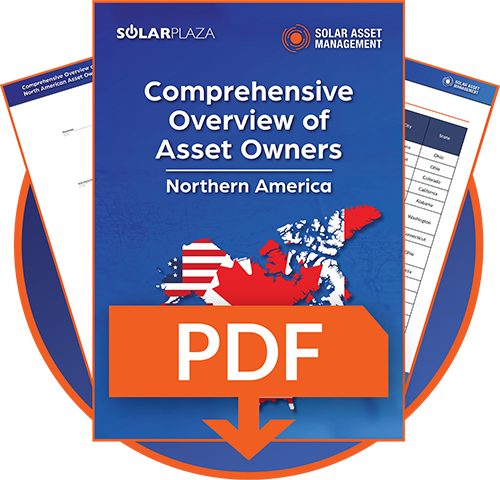 In the run-up to Solar Asset Management North America and to unpack the solar PV ownership landscape of the region, we have compiled a comprehensive overview of the 100+ solar asset owners and their corresponding active markets across US and Canada. Artificial Intelligence and Machine Learning have become topics of deep interest in the solar space and have great impact on the way we are building the blueprint for the new asset management and O&M landscape. This complimentary White Paper serves as an introduction to the Solar PV Plant Repowering. It covers basic definitions and repowering types, the main issues and considerations of repowering, key limiting factors, as well as future outlook and recommendations. In preparation of our 5th Solar Asset Management North America conference, we've released three complimentary whitepapers on important issues and innovations in the solar asset management field: Artificial Intelligence; Soiling; and Cybersecurity. The latest advances in Artificial Intelligence (AI) and Machine Learning (ML) have ushered a new era driven by automation. If the mantra of solar is that “The fuel is free; let’s reduce other costs”, artificial intelligence powered solutions can be the holy grail solar has been seeking. Learn more about the current implications and uses of AI in the solar industry. Many elements determine the optimum output in a PV module, one of which is the concept of soiling. Soiling occurs as a result of dirt, dust and other particles covering the surface of the PV panels. Although soiling cannot be prevented, its negative effects can be mitigated by dint of deploying dust-repellent agents and instruments. This complimentary white paper provides an overview of the current knowledge and practices around soiling. This complimentary 10-page white paper provides a brief, yet comprehensive overview of the phenomenon of cyberattacks & cybersecurity in the energy sector, the implications and considerations for asset managers and the current practices and research regarding cybersecurity measures. 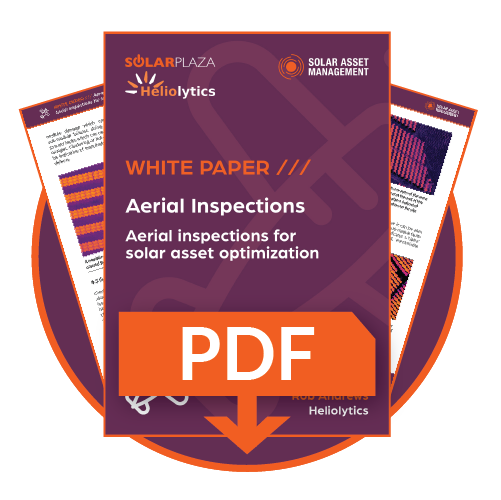 This complimentary 10-page white paper outlines the fundamentals of aerial inspection technologies, reviews operational results from over 6GW of projects globally, and outlines methodologies for integrating these tools into the operational plan for a PV project.